A lot of times when a stock falls we get an idea that it may not fall further or may remain there for sometime in a range bound region. In such a scenario you can trade a ratio put spread. How To Trade a Ratio Put Spread? 1. Buy X no of ATM (At the Money) Puts. 2. Sell X*2 (double) number of OTM (Out of the Money) Puts. Note: If you but 1 lot ATM put, you need to sell 2 lots OTM puts. But this can change depending on your view. For example if your view is pretty strong that the stock may not fall further, you may sell more than double number of puts than the number of puts bought. The point is you are taking a credit. You can sell as many puts you want, but the risk also increases. For example you can trade buy to sell in this ratio depending on your view: 2:5, 3:5, 2:10 – the combinations are virtually unlimited. Reward is limited to the premium received from the sold options plus any premium got by selling the bought options. Risk is unlimited if the stock falls. 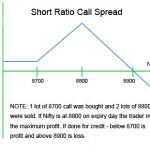 When to Trade Ratio Put Spread? When a stock has fallen and your view is that it may not fall any further or may fall 1 or 2% max till expiry. Volatility does not have much impact in this trade as some Puts are also bought. However profits do increase when the premiums are high as the trader gets a good credit. Usually when a stock falls, the volatility also increases, thus itâ€™s obvious that premiums will be high and you should get a good credit. Once the trade is done Volatility does not have a huge impact. Because if it falls you make money from the options sold, but lose money from the options bought. However if you have sold more than double the number of options bought, volatility decrease may help the trade. The sold options will make more money than the losses from the bought options. Note that itâ€™s highly recommended that you DO NOT sell more than double the number of puts bought. Risk is unlimited on the downside. If the stock keeps falling you may have a huge loss. Where is the Maximum Gain? On the day of expiry if the stock is exactly at the strike price of the sold options. The sold options expires worthless and the bought options have some intrinsic value – they do not expire worthless and give back some money to the trader. Stocks that do not have huge movement whether they fall or rise. HDFC bank is one such a stock. The idea is if the stock does not move – you should make a profit in a few days and exit the trade. Do not wait till expiry. Lets take another example. Reliance Ltd. Recently the stock has fallen a lot and your view is that it will remain here or increase slightly in the next one month. 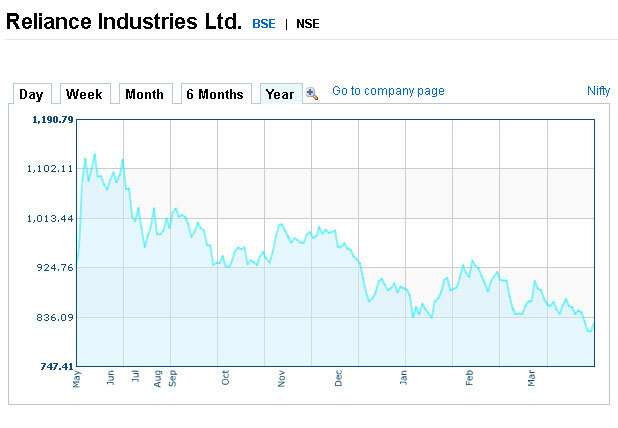 See that the stock has fallen a lot since the last one year and you think that it may not fall further. 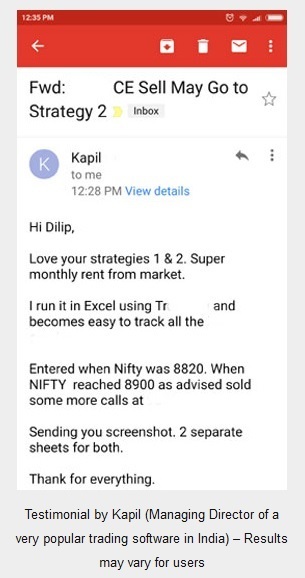 You trade the ratio put spread on Reliance. Now let me get real prices of Reliance Puts. Note that 4500-4000 = 500 is NOT max profit. Now if on 30-Apr-2015 the expiry day, Reliance is exactly at 800 (the sold Put strike price) this trade will make max profit. The 800 PE expires worthless = 4500 Profit. The 820 PE will be at 20 = 20-16 = 4*250 = 1000 Profit. Total Profit: 4500 + 1000 = 5500. The trade made profits from BOTH the sold and the bought options. Approx Rs. 52,500 will be blocked. (5500/52500)*100 = 10.47%. This is a great ROI. If stock is above 820 on expiry day, which is highly likely, I still make Rs. 500 profit – a 0.95% return. Lets take another example on Nifty. Margin Blocked: Rs: 1,08,000 approx. (13000/108000)*100 = 12.03% return in 30 days. 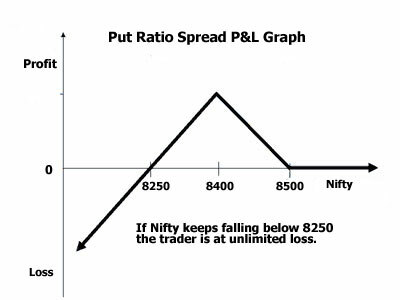 Even if Nifty is above 8500 the trader makes Rs. 5000, approx 4.6% return in 30 days. Yes Nifty gives more return than stocks for the same trade. The reason is the premium of the options vs. the margin blocked. To attract traders to trade in indexes the market makers make sure the premiums in the index options is better than the stocks, on top of that due to lower risk less margin is blocked. That is the reason why you see more option trading happening in index than stocks. This is true for all the stock markets in the world. If you are getting a credit trading put ratio spread, there is no need to calculate the upper break even. If you are paying a debit you may have to calculate the upper break even as well. However since this trade is mostly done on a credit lets calculate the lower break even on the Nifty trade. Since the break even will depend largely on the points received and paid you may need to calculate your break even every time you trade. In our case it is 150 points below the sold put strike. Buy 8500 PE is: 8500 – 8250 = 250-120 = 130*100 = 13000 profit. Sold 8400 PE is: 8400 – 8250 = 150-85 = -65*200 = -13000 loss. Hence if Nifty is at 8250 on expiry day, this trade will be at break even. Below 8250 it loses money. What is the risk in the trade? If Nifty keeps falling the extra options sold on the 8400 strike will increase in value and start making losses. Remember these are not hedged so losses can be unlimited. 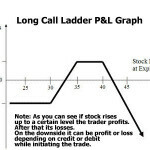 Therefore to restrict losses it is important to take a stop loss exactly at the strike price of the puts sold. If you leave and Nifty reaches 8000 – you may suffer heavy losses. How to increase the return? If you are a technical analyst you can sell the puts at the support level strike. However there is no guarantee that the stock may not fall further. If volatility is VERY HIGH and you assume after the news it may crush, then you can sell more than double the number of puts you bought. However please do not increase the buy : sell ratio of 1:3 – means 1 put buy and 3 puts sell. If volatility gets crushed after the news, you can immediately realize a good profit and square off the position. It does not matter even if the stock moves down slightly after the news is out. The volatility crush will help the sold puts and since you have sold more than you have bought, the whole trade will be in good profit in only few days. It gives the best return on expiry day. Should we wait till expiry? Traders waiting till expiry are trading a bad strategy. No trade should be done to be taken off on the expiry day. Profit or loss should come much before to expiry day. That predetermined profit or loss should be there in your mind when starting the ratio put trade. Once its achieved exit and look for another opportunity. 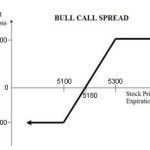 Ratio put trade is done when the trader thinks the stock may rebound or may not fall further. It is done by buying ATM put and selling double the number of OTM puts. 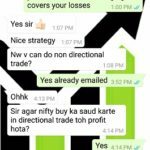 If stock is at the short put strike on expiry day maximum profit is achieved. If stock is above the bought puts still some profits can be made. If stock keeps falling the trade can lose a lot of money, so traders should take a SL when the stock has reached the short put strike to limit losses. Have you ever traded ratio put spread? If yes let us know what happened in the trade. Every article posted by you on this website will definitely help traders/ investors. Thank You Abhishek. I am glad that you read all my articles. Yes even I write in the hope that retail traders who do not have much information online get some knowledge and ideas on option trading. 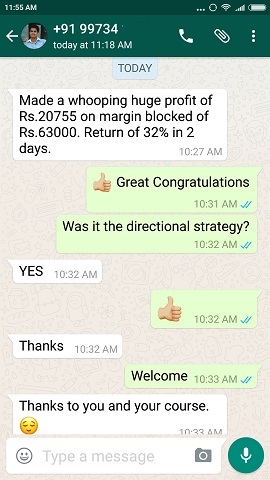 For NIFTY 8500PE(100-buy) & 8400PE (200-sell), my broker says total margin required is Rs.1,07,000/-. But your NIFTY example says only Rs.52,000/- margin is blocked. Am I missing something ? Still, Nifty gives more return than stocks for the same trade. 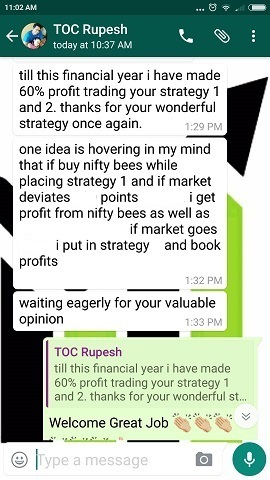 One thing i wannted to ask regarding example given of nifty for the strategy. 120-100 = 20 * 200 is 4000 loss as described by you. But we have bought 100 quantity of 8500 put. So i thik it should be like this if i am not wrong. 120-100 = 20 * 100 is 2000. And what if nifty closes above 8700 on the day of expiry? What will be the calculation? The 8500 Put value will be 100, if on expiry day Nifty is at 8400. Since it was bought for 120, it will lose 20 points as by selling the trader only gets 100 points, but he paid for 120 points – so a 20 point loss. If Nifty closes above 8700 (in fact anywhere above 8500 – it does not matter where) ALL options will expire worthless and the trader can keep the credit (or debit) when he started the trade. In our case he got a credit. So he keeps Rs. 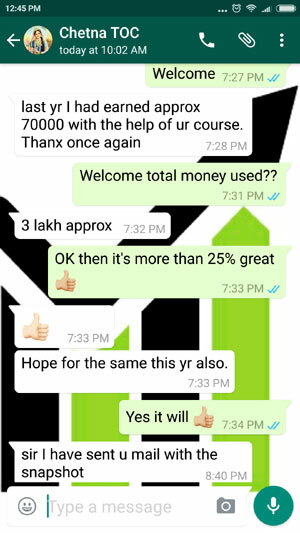 5000/- credit as profit.